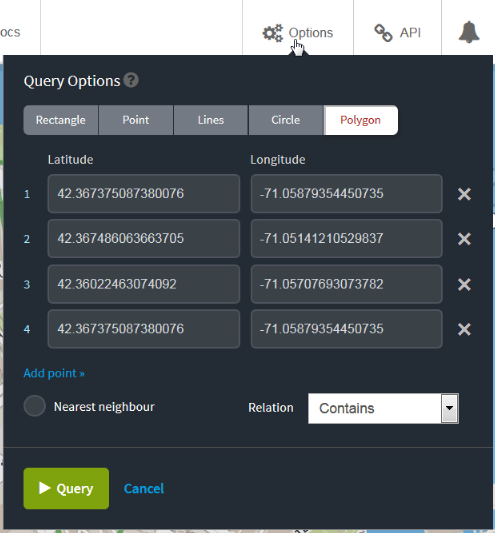 This overview of Cloudant Geospatial shows how you can combine the advanced queries of geographic info systems with the flexibility of Cloudant’s database-as-a-service. Learn the best practices and special techniques for building a Cloudant Geospatial index, then watch how to query it. The example database showcased in this tutorial contains crime incidents data in the Boston area. Type crimes_replication for the _id. For the Source database, click Remote Database. 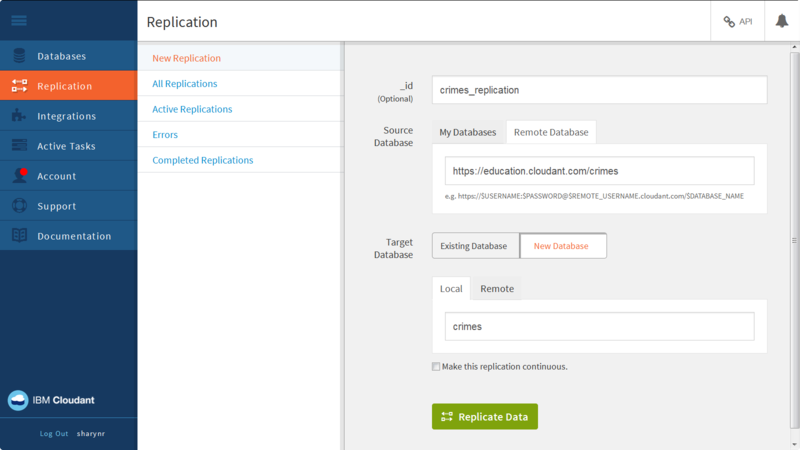 For source database name, type https://education.cloudant.com/crimes (the permissions are already set to allow anyone to replicate locally). For the Target Database, click New Database. Click Local to create a local database in your account. Type crimes for the database name. Ensure that the Make this replication continuous field is unchecked. Provide the account password you saw back on the Service Credentials tab on Cloudant IBM Cloud Service Launch page, and click Continue Replication. Click the All Replications tab to see the replication request. The status is Triggered, and it may take a few minutes to complete. Click Completed Replications to see that it completed. Back on the Databases tab, verify that the crimes database displays in your list of databases. There are 272 documents in the database. Open the database to see the list of documents. 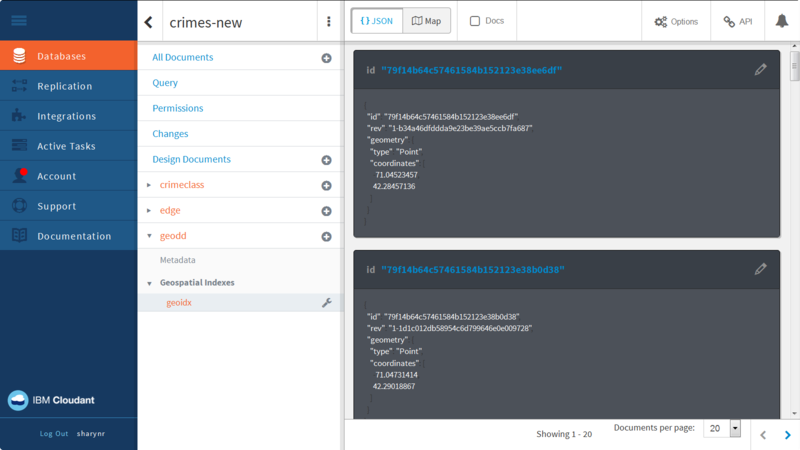 From the Cloudant dashboard, open the crimes database. Open one of the documents to see the type of data stored in the document. If you’ve formatted your data as GeoJSON format, indexing is easy. Click Cancel to close the document. Click Design Documents. In this example, the design document _id is _design/geodd. Expand Geospatial Indexes to see the geo indexes. Click the wrench next to geoidx, and then select Edit. Click beautify this code to see the index definition. The “index” function checks for a valid geometry object, and then runs the st_index function on doc.geometry. You can query the Geo Index right from with the dashboard, and view the results right on the map or you can see the list of documents in the search results. Click Cancel to close the index definition. Click JSON to see a list of the documents in the search results. Click Map to see the document search results on a map. The API link provides you with the URL for the query. Click API. You can also click one of the points on the map, and then click Edit document to open the document for editing right from here. There are several types of query geometries: rectangle, point, line, circle, and polygon. Let’s look at an example of a rectangle query which specifies the latitude and longitude of the lower left and upper right coordinates of the rectangle. Click Run Query to view the map. Here you see the results of the documents within that bounding box displayed on the map. Use the zoom to see the entire rectangle. 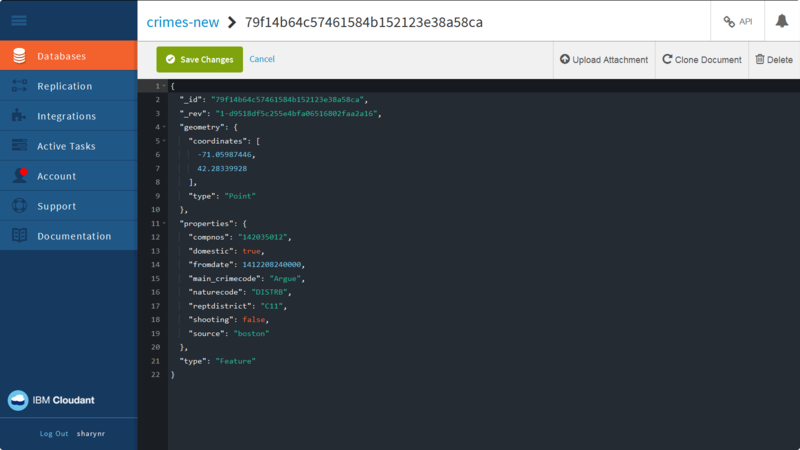 Click API, then click View JSON to see the URL used for the query. You can see that the rectangle query uses a bounding box relation query (bbox) similar to the query shown below. Here’s an example of a point query. Back on the Cloudant dashboard, click Options. Deselect the Nearest neighbour option. There are no results found when you run this query because no crimes were reported at those coordinates. But really you want to see the crimes reported near that point, so you want to use the nearest neighbour option. A nearest neighbour query returns the objects whose coordinates are closest to the point. 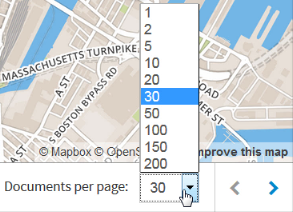 The map is showing the 20 nearest locations using the number of documents per page setting to determine how many to show on the map, but you can change this setting. Change Documents per page to 5. View the list of JSON documents to see the five crime incidents nearest to that location. Click JSON. Click API, and then click View JSON to see the URL for this query which uses a point geometry type similar to the URL shown below. For a line query, you need to specify at least 2 points. It makes sense to use the nearest neighbor option here, too, to find the 5 closest crime locations to the line. Click Run Query to view the map. It looks like there’s only one document. Click JSON to see all five of the documents reporting crimes at that same location. Click API, and then click View JSON to see the URL for this linestring query similar to the URL shown below. This example of a circle query specifies the coordinates for the center of a circle along with the radius of the circle, and returns a map with the reported crimes within the circle. Click Run Query to view the map. In this case, there are only 3 reported crimes within that region. Click API, and then click View JSON to see the URL used in the query similar to the URL shown below. Lastly, you can use the drawing tools to form a polygon, such as, a triangle, quadrilateral, or pentagon. Back on the Cloudant dashboard, click the Draw a polygon icon, and draw a triangle. This query returns just one reported crime within the triangular region. Select Polygon. While your points will be different than this example, you will see the three points that form a triangle, and the fourth point is the same as the first point in order to close the shape. Click API, then click View JSON to see the URL for this polygon geometry type query similar to the URL shown below. 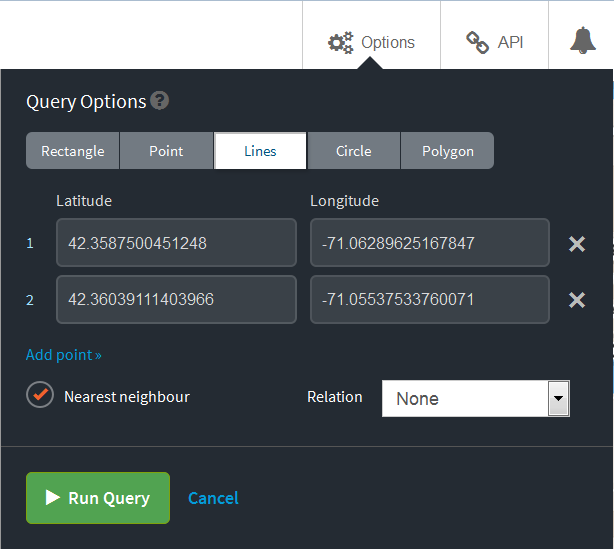 In Cloudant, geospatial relations are specified by the relation query parameter. So far, all of the examples have used “Contains”. However, Cloudant Geo supports several standard geospatial relations. For more information, refer to the Cloudant Geospatial documentation. 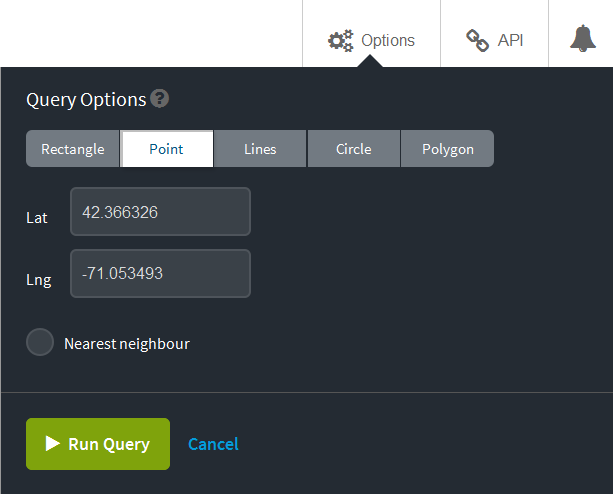 You’ll notice that in the URL for polygon, point, and line queries, the geometry value is not in JSON format. Instead, it uses Well Known Text or Well Known Binary object. Refer to this Wikipedia article http://en.wikipedia.org/wiki/Well-known_text to see more about Well-Known Text. See how Cloudant Geospatial is used in an app that maps data sourced from a public crimes database. You can attach files to a document which allows you to create a Couchapp right inside your Cloudant database. Click View Attachments. Click index.html to load that page. You’ll use this page later on. 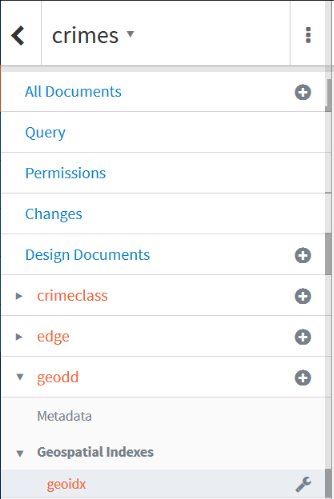 Switch to the Cloudant dashboard tab, and click Cancel to go back to the list of documents. 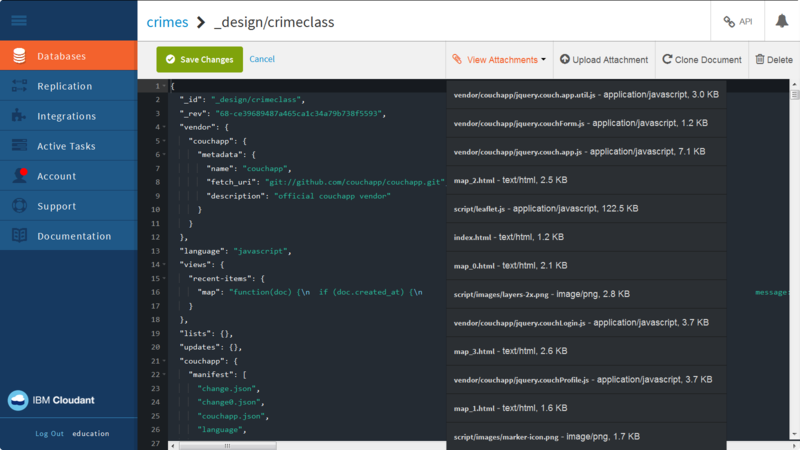 Click API, and then View JSON to see a list of all the documents in the crimes database. You can view the design document to see the Geospatial index. Replace _all_docs with _design/geodd. This query searches for documents containing geo location information within a 10,000 meter radius of the specified point. Return to the index.html page you opened earlier. Click the first link which shows 200 documents within 10,000 meters of the Boston State House. Right-click to view the HTML page source to see the CloudantURL used in the query. It’s the same query you saw in the last procedure that is now displayed on the map. 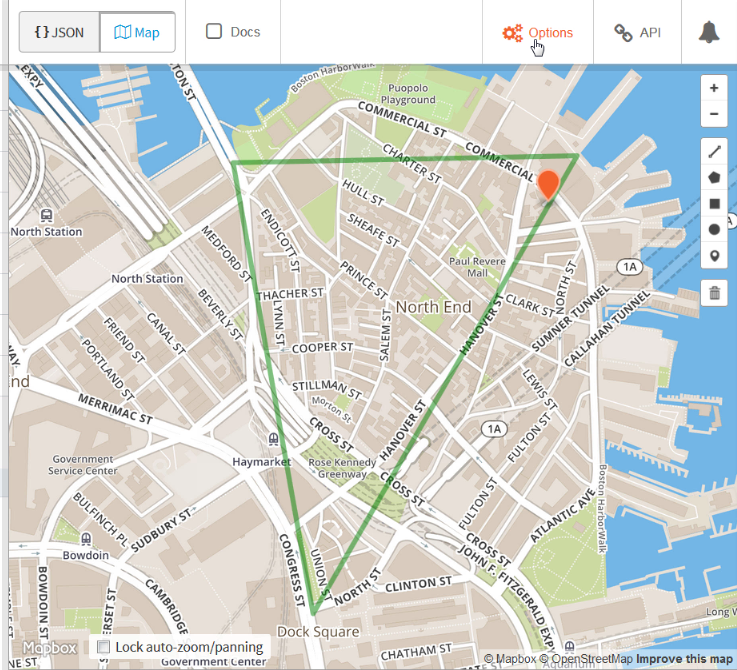 Now you could use Cloudant Geo’s abilities to look at all the crimes that occur along a specific street in Boston. This would be useful for a police department focusing on evaluating the effectiveness of a campaign to increase patrols along a certain street indicating an area of interest. Follow these steps to view the second map. Go back to the index.html page, and click the second link which shows the Commercial Street Boundary. This next map visually combines the crimes with the Commercial Street corridor. Follow these steps to view the third map. Go back to the index.html page, and click the third link which shows the Commercial Street SafeWalk corridor and last night’s nearby crimes. 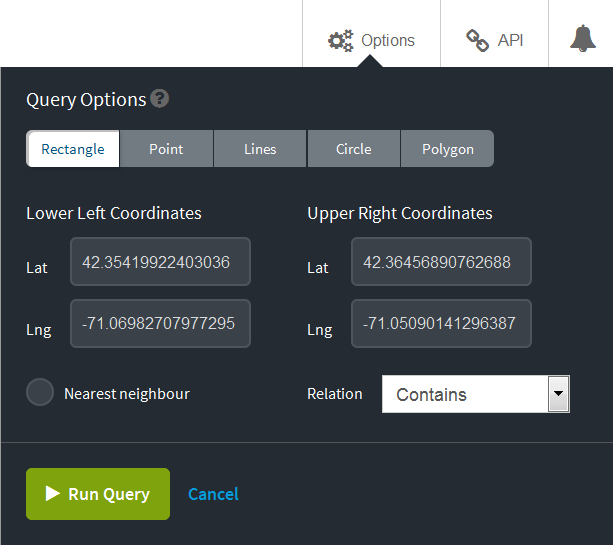 Right-click to view the HTML page source to see the radius Geo query to Cloudant in the ‘cloudantURL’ variable, and the changed latitude and longitude values to center on Commercial Street. This next map limits the crimes query to the Commercial Street corridor. Follow these steps to view the fourth map. Go back to the index.html page, and click the fourth link which shows the Commercial Street SafeWalk corridor and crimes in the corridor. Right-click to view the HTML page source. This time, you’re taking that polygon defined in the ‘commst’ variable and putting it into the database query. 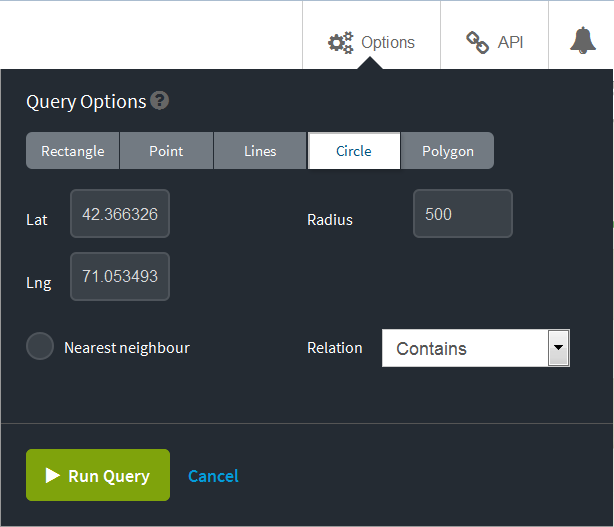 You wouldn’t use a radius query, but instead query by polygon. You can’t copy the GeoJSON as-is into the query. You first need to translate it into Well-Known-Text (WKT) format, which is a standard that’s more URL-friendly. Once again, the magic happens in the “cloudantURL” variable. That’s the basics of using IBM Cloudant Geospatial! The tutorial requires a unix shell, native on MacOS laptops, and available through tools such as Cygwin on Windows laptops. If you are using a Windows laptop, and need to install Cygwin, follow these instructions, otherwise, skip to the Start the Tutorial section below. Create a cygwin folder, and download setup-x86.exe or setup-x86_64.exe to that folder. Click Control Panel->System->Advanced system settings->Environment Variables. For the Path variable, click Edit and add c:\cygwin. Copy c:\cygwin\lib\python2.7 and c:\cygwin\lib\python3.4 to c:\cygwin\usr folder. Ready to dive in? Read the Cloudant Geo documentation.